Rosalie and I had a girls day out and so I thought we would dress up for the occasion. Tea and cake at our local coffee shop was on the agenda. I love this little dress. I picked it up last year in the Next Sale. I have tried it on Rosalie a few times over the last year but it has always been a little big. This time it fit perfectly. It’s great for the spring season. The summery style dress in made out of a denim material so is actually quite warm. The ombre design is pretty cool too. I teamed it with these grey cable style tights from Next as it’s still a little chilly and Rosalie’s new patent T bar shoes from Tesco. I think she looks good enough to eat. We are linking in with Sarah from This Mama life’s weekend tot style take a look at her blog if you’d like to join in too. How cute! Love her dress and her shoes too. Next do some lovely children's clothes and even better if you can buy them in the sale. Such a cute dress i love ombre look of it. There are so many fab clothing peices out for summer for both boys and girls. Such a lovely dress. I love Next clothes for my little boy. Eeek what a gorgeous dress! I am a huge ombre fan and also love a bit of denim so loving this little beauty. The tights and shoes you've paired it with are perfect too 🙂 Hope all is well with you guys. 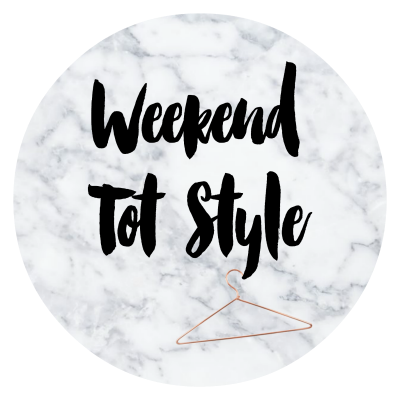 Thanks so much for linking up with #weekendtotstyle!